A New and Accurate Map of Switzerland with its Allies and Subjects. A New Plan of the City of Geneva. 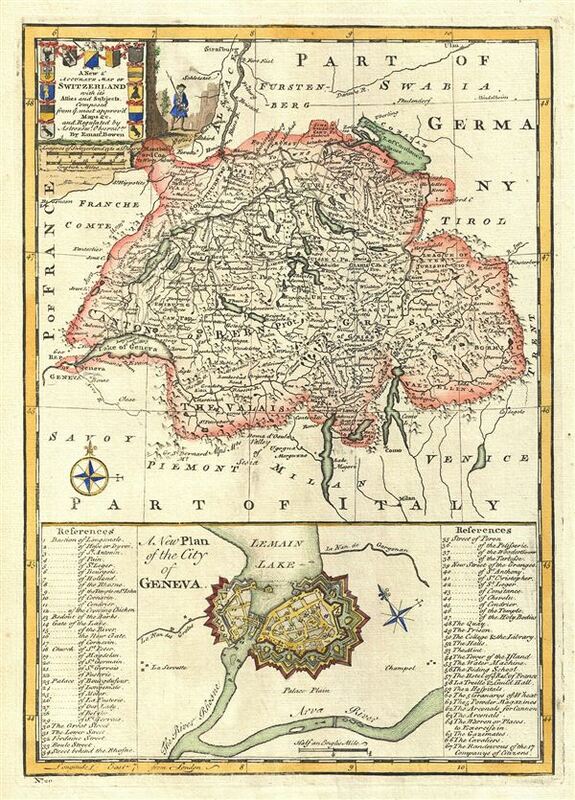 A charming 1747 map of Switzerland by the British cartographer Emanuel Bowen. Essentially two maps on a single sheet, the upper map covers all of Switzerland from Montbeliard in modern day France to Lake Majori. Several important towns, lakes, cities, rivers, roads, cantons, etc. are noted with mountains rendered in profile. The title cartouche in the upper left quadrant features thirteen coats of arms and an illustration of a soldier. The lower map features a plan of the city of Geneva. Lake Geneva, the Rhone and Arve rivers are beautifully rendered. A list of 67 locations marked on the map is included on the left and right side of the map. This map was prepares by Emanuel Bowen as plate no. 20 for the 1747 issue of A Complete System of Geography. Rumsey 3733.019. Philips (atlases) 614 (1752 edition).